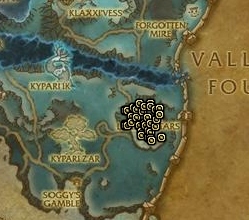 Here's a nice way to make wow gold by farming mobs non-stop. Personally I prefer these over dungeon farms, as you can do this until you have the gold you needed, without the need to worry about reaching the hourly limit. This wow gold guide is also a bit better than most others when it comes to the items you'll be selling. The loot card giveaway has ended! Dread Wastes offer many ways to make wow gold. This is my second favourite. High level Mists of Pandaria Crocolisks offer 3 items that you should be interested in. Lower level crocolisks should be avoided. In this particular wow gold making tip we'll be focusing on the Coldbite Crocolisks in Dread Wastes. They're level 90, so make sure your toon is at the appropriate level. Your main income will be from Raw Crocolisk Belly. On my realm they have been selling for 10-40g each for several months now, so this gold making tip has stood very profitable. If the price ever drops below 20, I will just flip them without worrying, as no one really farms crocolisks. You'll also get a nice amount of Harmony Motes. You can use these for anything, like buying Crocolisk Bellies from a vendor in Halfhill Market, if you convert the Spirit of Harmony into a cooking reward and grab a bag of them. The average price for a belly is 30g on my realm, and 40g for a Golden Lotus, so it's more profitable for me to focus on bellies instead. You'll also get a High Quality Crocolisk Leather by a low chance. It's vendor junk, but sells for 9 wow gold. I wouldn't really use the bellies for anything. It's better off to just sell them as they are. The mobs itself are very easy to kill if you have a decent ilvl and more importantly self heals, so you can tackle even 4 at once. Their respawn times are quite fast too, so you'll never have to wait around. Most of these Crocolisks are underwater, so there's no competition ever, unless someone is doing a non-daily quest. The pool is not deep though, so if you have ranged attacks, you don't really need to swim much. To speed things up literally, I would recommend to choose Speed King buff to help your watery grind with a double jump every 5 seconds. The giveaway has ended and winners have received a PM to their Loot Hunter inbox. Reply to it within 48 hours to get your loot code. Check back here after a few days in case some loot cards didn't find their new owner in 2 days, as like always, they will be given away in a new giveaway in this wow gold guide.